Things have been more than a bit hectic over here. We've just moved into our new house, one of our cats is sick (and needs to be coaxed into eating her foul-tasting pills twice a day), and work is in overdrive, with plenty of long hours including a sleep at work one evening. We've been cooking and eating out as much as ever; I just haven't found the time to blog about things, until I've waited so long that I've lost the inspiration. If you are interested, you can see a more timely update of what we've been up to on my Facebook page. Poaching free range chicken breast for the sick animal. Along with our new house comes the new experience of cooking with gas. It's amazing how quickly the stovetop heats things up, but frustratingly, it seems to be pretty difficult to cook at a low temperature, even when we place a spacer underneath the pot. When we tried to slow-cook beef bones and salmon frames into palatable jellies for the cat, we couldn't get the stock to simmer; it was at a furious boil for hours. When we made chili con carne using the unseasoned boiled mince the cat rejected, we managed to burn food on the sides of the pot. And the oven is so well insulated that it not only comes to temperature in a matter of minutes, we can barely smell whatever it is that is being baked. It takes some getting used to, our new kitchen, but it is an improvement on the one at our old flat. The secret to a delicious chili, we've decided, is the addition of a bit of cocoa powder and a rich, flavourful sugar. We used malt syrup this time, but molasses sugar is also great, and other people add a square of chocolate instead. We also managed to use up the jar of pickled jalapeños that has been sitting in our fridge (a small triumph—the pickled cucumbers left over from our burger making experiments are next in the firing line). Which brings us to what we tried making after that (hint: the title of this post gives the game away already). Now, I've seen some pretty wacky ingredients in my time. For vegans, I have produced a chocolate mousse tart using tofu, and a buttercream frosting made of avocados, the green colour of which makes me think it really ought to taste like mint, especially if you are pairing it with chocolate cake. Both of the above tasted of their respective ingredients, mainly because I couldn't bring myself to add as much sugar as it would take to drown the flavours out. Bean brownies are not so odd, if you are used to Asian bean-based desserts, and I am all geared up to try pizza with a cauliflower crust. 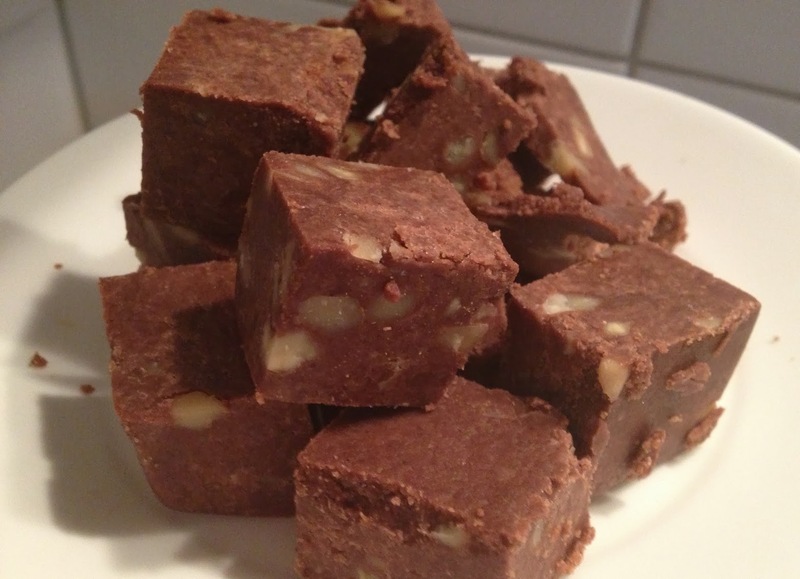 I can understand why you might use unusual ingredients if you have dietary restrictions, but when I came across chocolate cheese fudge, I was astounded. I know people use cheese in desserts. In fact, I love cheesecake in many different forms. But we are not talking about cream cheese here. We are not even talking ricotta or mascarpone. What the recipe calls for is processed cheese, which you can't even buy in blocks anymore in New Zealand! Fortunately, we had some individually wrapped slices in the fridge, again left over from making hamburgers. Unfortunately, we only had one plain slice; the rest were smoked (or rather, smoke-flavoured). Seeing as putting cheese into fudge sounded ridiculous anyway, we ploughed on ahead. Melting together the processed cheese with butter. As you might expect, the processed cheese was rubbery and didn't really want to mix with the melted butter. But although it seemed like far too much icing sugar for the amount of yellow goo, the resultant crumbly mixture compressed into an oily Play-Doh-like clump, which set in the refrigerator into a smooth, firm block of fudge. Mixing the cheese into cocoa and icing suagr. Unsuspecting tasters thought the fudge was delicious, but commented it was saltier than usual, like salted butter caramels. On being told it contained processed cheese though, the reaction was generally one of disgust. And the smokey flavour is obvious once you know about it. When I shared a post about cross-cultural food preferences last week, a friend who opened a Western restaurant in China commented that his customers loved fruit pizza (yes, with cheese, and lashings of chocolate sauce! ), although they would often eat around the cheese on the purely savoury pizzas. Who's to say what's weird, as long as it tastes good? What unusual recipes have you come across? This post is part of Our Growing Edge, a monthly blogging event aimed at inspiring us to try new things. This month it is hosted by Marnelli from Sweets and Brains. Oh my gosh that sounds so strange! I'm impressed you gave it a go -and even more impressed you managed to get others to try it! Well, I didn't tell people it had cheese in it until afterwards, so they had no reason not to try it! It is actually surprisingly good!